I’ve gone into my 2012 card before. This was probably the hardest year for me to come up with a concept and the execution isn’t the best — especially because it’s so hard to see what the image is supposed to be. This year marked another departure from my core concept of the Christmas card. Instead of featuring either Chico, Northern California or myself, the card features a conceptual snow angel rendered as confetti on the floor of my workplace at the ChicoER. I appreciated the help from my friend Evan, but overall this card could’ve used a bit more polish. Unfortunately, this card was photographed on Dec. 21 — one of the latest cards I’ve shot. I remember trying to get the cards printed in San Diego, but they would’ve taken too long to print. As it was, they went out after Christmas. in a hot town like Chico! On a positive note, this was the first Christmas card shot with my sister’s Canon PowerShot camera. It has better resolution and a more powerful optical zoom than the old Sony I was using (and the screen still worked, which was something I couldn’t say for the Sony at the end). In any case, there’s more to the story here (including my original inspiration from a live-band karaoke show in Oroville). 4 — Days before Christmas when I shot the primary photos. 5.3 — Miles traveled to shoot the card (at work). Also, these mileage totals are one-way — I don’t want to inflate my numbers. 18 — Photos taken for the 2012 card (that number’s about to get _a lot_ bigger for the 2013 card). I’ve previously written about my 2011 card when it first came out. After taking a couple of years off from being wholly focused on Chico or Northern California, the 2011 card was based on an inside joke with a friend during a long-ago karaoke night. Although my friend had moved on to greener pastures when it came time to shoot this card, thankfully Autofry was still around (although it too has since moved on to whatever counts for greener pastures among industrial food machinery). Despite my griping, I ended up using one of Costco’s templates for the card design. I generally think it worked out OK, although I’m bummed that there’s no high-res version of the card that could be saved electronically for my records (although I suppose I could scan a print digitally). The 2011 card is unique because my friend Marcus only shot one photo on his cellphone. Compared with other years, I only had one option with this card. Thankfully, it worked out. Again, I’ve written more about the 2011 card here. 1 — Number of pictures taken for the card. 1.6 — Miles traveled to The Maltese for principal photography. 8 — Onion rings visible in the photo (they were delicious). OK. I missed a couple of days because of work and because … I was mailing this year’s card to friends and family. Thankfully, I’ve already written about two of the three days so it should be fairly easy to catch up. I haven’t yet written about my 2010 card, which was the first year that I almost didn’t do a card. In December, I was still recovering from two medical scares from the summer and fall. I recall not having a lot of enthusiasm for the project, especially if it entailed physically making the cards as in the first two years. Despite this and other challenges, the 2010 card turned out to be one of the more whimsical designs that I’ve created. This was the best pic from my initial effort for the 2010 Christmas card. So, I went back to the drawing board for another concept. Thankfully, it came together fairly quickly once I had the idea of “popping” into the card from an unexpected angle and located the needed headgear (from Wal-Mart). As I pondered how unbreakable the unshatterable ornaments were, I bought a pair of wearable reindeer antlers with a mini Santa hat. I tried a couple of different places to shoot the primary image, including Woodstock’s Pizza. The images were just OK, but it did produce this fun, if a bit blurry, “Christmas buddy cop” pic with my friend Heather. Eventually, I think I went back to my apartment to shoot the main pic with the Cybershot. My primary concern is that I wasn’t happy with my hair. Given my medical issue, my hair decided to go on a temporary vacation. At the time, I was worried that it was a symptom of a far larger problem, but thankfully the hair grew back (for now). The primary pic turned out pretty dark, but Photoshop was able to salvage something usable over the neutral background of the hall last seen in the 2009 card. If you look closely, my ability to “cut out” the ball on top of the cap was pretty limited. I hopefully know how to fix that now. When it came time to finishing the card, I think I used the text tool in Photoshop to add the seasonal message. I’ve looked at the card templates at places like Costco and online with iPhotos/Photos. Although I’ve ended up using templates over the years, I generally don’t like how they leave a limited amount of space for the photos. At the same time, the photo cards I received from other friends and family looked presentable and perhaps a little more professional than my earlier, artisan efforts. This was the first year that I used Costco for my cards. I realized in 2009 that Costco was fairly economical for their standard-sized photo cards to the point that it was cheaper than my printing out the photos separately and pasting them on cardstock. It also saved a lot of time — I could have 50 cards and envelopes ready in a day when I would take me considerably longer to make the cards myself. The only real downside is paying for the annual membership, but I’m fairly strategic on when I renew so I only have membership when I really need it (every December). Despite the difficulties, the 2010 card got out of the door (although they were probably late). I liked the main image so much that I usually use it as my avatar online at least once or twice whenever I’m feeling in the holiday spirit. 1.94 — miles traveled for the card (although I ended up using pictures shot in my apartment. 3 — days before Christmas when I shot the primary photo for my card. Continuing with my look back on nine years of Christmas cards, 2009 marks the second year and the final year of doing entirely homemade cards. While the card production was simplified from the first year (no elaborate cutting), the main image was a bit more complicated as it featured me twice. The theme of the card was intended to convey passing the spirit of Christmas on to others. What turned out has been described as “creepy” by a dear friend because of the black gloves in the picture (although the right glove is dark blue even if it didn’t come out that way). That was certainly _not_ my intention, but my hands weren’t photo-ready that year and I needed to improvise. My previous blog entry on the 2009 card doesn’t go into too much detail, but I used Photoshop so I could play both giver and receiver of the tiny tree. It’s nice that retailers sell trees of all sizes — I decided to use trees sized as lawn ornaments for the card. This was my first deviation from doing holiday cards focused on Chico or Northern California, but time was short that year and I still incorporated a personal touch to the design. I again used the family Sony Cybershot for photos. I set it up on a tripod in my apartment facing a hallway wall that I thought had sufficient light. I abstained from using the flash, especially because I wanted the Christmas lights to stand out on the tree. Unfortunately, the light in the hallway wasn’t sufficient (at least for my camera and my personal technical ability). I turned on more lights around the hallway (which opened into the kitchen/living room) and arranged a directional light on the “set.” A friend liked the noir look of one of my test shots. I primarily focused on getting the left side of the card right — making sure the angle and presentation of the tree was correct. As the test shots below indicate, it was difficult to get everything _just_ right (especially when working with a camera timer) but I eventually got a shot I was satisfied with. I also tried to hide the power cord connecting to the tree’s lights. I was only partially successful, as one can see a power plug hanging from my coat sleeve. I changed coats and gloves to shoot the right side of the card. I was worried about the shadow that the arm cast against the wall, but I was pretty confident that I could use Photoshop to edit out the shadow. After getting my shots, I used the computer to compose the primary image. I attempted shot a neutral background as a canvas, but the final product doesn’t particularly reflect that. I remember the image came together pretty quickly as there were only really three elements. That said, doing any sort of cutout of a pine tree is a painful experience (one that I’ve repeated in the 2016 card). For the last time, I printed out the image as prints at a local store. I switched up the white cardstock for red for a little more visual pop. I also used a printer for my message “Spreading a little holiday cheer… and wishing you a Happy New Year.” Although it was a bit tricky to align everything correctly, I liked the clarity of the printed text although I missed the personal touch of the handwritten cursive of the previous year. I used a glue stick to attach the photo to the card. It was time consuming and I strove to make sure the image was centered correctly. I earlier wrote that I eliminated folded cards after 2008. My memory may be hazy — I seem to recall a fold in the 2009 card because I wrote on the inside of the card. However, I think the fact that I didn’t have a great message for the card’s interior was a key reason for moving away from folded cards. The other reason for moving away from folded cards also included the realization of the relative economy of photo cards purchased from a warehouse store, but that’s a story for the 2010 card. 0 — miles traveled to photograph the card (this was the only year so far shot entirely at home, although 2010 comes close). 3 — Trees included in the lawn decoration set. 5 — Days before Christmas when I photographed the card (again, not really enough time to get everything done). 18 — photographs taken for the 2009 card. Christmas Time is here and I’m starting my annual effort to spread a little cheer. For the past nine years, I’ve been making my own holiday cards. While I’ve generally tried to follow a theme of Northern Californian elements, sometimes I’ve focused on some aspect of my life or followed whatever fancy suited me that year. 2016 will be a bit different … but mostly the same. I’m back in Utah, so the “local” theme now applies to the Intermountain West instead of Chico. Some other things that are staying the same — I shot on location this year as I did 87 percent of my previous cards AND I’m working to make sure they get to people’s mailboxes before Christmas. To help encourage me to make my deadline, I’m doing a countdown to look back at the eight previous editions of the card culminating with the online debut of my 2016 card. I’m (unintentionally) timing this to end on Dec. 23, which will hopefully allow enough time for the new cards to arrive in the mail and for me to wrap up this holiday special before St. Nick arrives the following day. Aiding my card quest is the fact that I’ve written about four of the eight past editions of the card (to keep things fresh, I’ll be adding some pictures from years past and add some recollections). In all the cases, I try to do something new and something fun. Sometimes the cards are planned months in advance while others come together very quickly. Procrastination rarely helps the execution of the cards, but sometimes inspiration drops a good idea on my head like Santa and a bag of presents down a chimney. I previously wrote about my first card just after it came out and blog posts around the time detailed my creative process in developing my first Chico Christmas card. The first card was probably one of my most ambitious ones in terms of execution. I loved the giant (functional) wooden yo-yo at the Bird in Hand store in downtown Chico and thought it would make a great sight gag. In order to pull the gag off, I needed the front of the card to isolate the yo-yo, letting the joke reveal itself when the reader opened the card. There was a decent amount of stenciling and cutting to get the front of the card properly show the toy. After everything was cut, I needed to glue the photo of the yo-yo in the exact proper place or the illusion wouldn’t work. I also chose a heavier white cardstock to help with the presentation (I worried that regular paper was too flimsy). If I recall correctly, the weight became a bit of an issue because the cards were right on the cusp of being too heavy for a single, first-class postage stamp. I remember not wanting to take the risk and bought a little extra postage to make sure everything go to their destination on time. This first card was a lot of work and cost a decent amount of money (photos, paper, crafting supplies, postage, etc. ), but I liked this initial effort. I wasn’t super happy with my handwriting as a key element of the card itself despite the homemade touch of it. Future cards wouldn’t feature handwritten elements (although I still pen a general message to every recipient). This is also the only folding card that I’ve made in the series — the 2009 card was still mostly handmade, but then I discovered the economy and efficiency of photo cards from a certain well-known wholesale retailer. 0.71 — miles traveled to shoot the card. 5 — number of days before Christmas when I shot the principal photography (obviously not enough time). Here’s a look at the 13 shots I took for my 2008 Christmas card at Bird in Hand in Chico, California. In just over 24 hours, the grueling 17-month-long election cycle will grind to a merciful halt. Even after weeks and weeks of ceaseless discussions, debates and squabbles, there are still some issues that haven’t been analyzed to death. One of those issues is the ballot selfie. For those needing an explanation, the ballot selfie is where a voter takes a self-portrait with his or her ballot primarily to show who he or she voted for. In years past, it generally wasn’t an issue because people generally don’t take standalone cameras with them into the voting booth, much less wait for the photos to be developed and then converted into a format that can easily be broadcast to others. It became more of an issue in the past decade as nearly everyone now has a camera on their smartphones and can share anything with the tap of a screen. States have conflicting laws about whether these self-portraits are permitted. USA Today publshed a breakdown, showing about two-fifths allow them, while two-fifths ban them and the rest is a muddle. For example, California law doesn’t currently allow them (despite a last-minute appeal by the ACLU), but a law overturning the ban will go into effect next year. Conversely, Utah allows selfies. When I first heard about the issue about two years ago, I was generally opposed to allowing such photos. I theorized that the photos could provide proof in any sort of vote-buying arrangment. Such a thing could undermine the integrity of a secret ballot. At the same time, that’s merely a theory. At least one federal court has ruled that it’s not a compelling reason to abridge a person’s First Amendment rights to express themselves in this manner. That makes sense — under strict scrutiny, a government needs to be able to show a compelling reason for a narrowly tailored law that abridges a constitutional right (and that the proposed law is the least restrictive means to accomplish this compelling purpose). That said, I’m not a lawyer and I’m not 100 percent certain that strict scrutiny is the standard here. In any case, my concern about any hypothetical vote buying diminished when I thought about some of the practices around voting. Of note, if a voter incorrectly marks a ballot, I know some states allow the voter to return the mismarked ballot and ask for a clean one. Theoretically, someone could take a photo of a blank ballot prior to filling it out and subsequently use Photoshop or a basic redeye tool and virtually mark the ballot as they see fit. With those potential safeguards, I reached a measure of peace about the ballot selfie. Ideally, people use these photos to show they are engaged in civic participation, something we generally need more of in this nation. 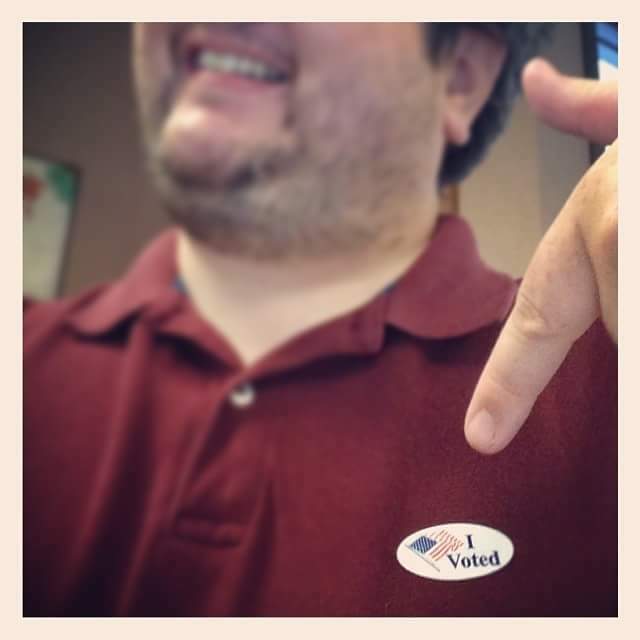 Then again, there’s the old adage: “Better to remain silent and be thought a fool than to speak and to remove all doubt.” We’ve certainly seen a lot of family and friends prove this saying on social media during this election cycle and posting a ballot selfie may only provide additional confirmation. I’m tempted to take a ballot selfie myself Tuesday, but I would have to obscure my actual choices. It’s professionally unethical for me to disclose who or what I voted for and that suits me just fine (especially after what I mentioned about people proving themselves the fool). In any case, Tuesday is the big day. If you haven’t already voted, this is your chance to have a say (balanced against others, of course). I’ll see you at the polls.